Tells about the basic advantages of AutoCAD electrical over normal CAD. This session is the first step for an electrical engineer to get into ACADE. Must know function to set component scale and rotation angle. This is one of the most useful features in AutoCAD Electrical, which enables to do easy wire cross referencing (From and To). Many times people do manual editing in each title block individually and with thorough understanding in “title block” function within ACADE one can do the changes in all sheets in one go. In electrical circuits we use parent and child components (eg. Coil and Contacts of a relay) in different parts of a project. In order to study and read one circuit it is always necessary to trace the locations of all the parts of one component. This automatic cross referencing is another major advantage of ACADE. Managing a project in proper way is as important as creating a set of drawings. This skill makes you a perfect professional design engineer. 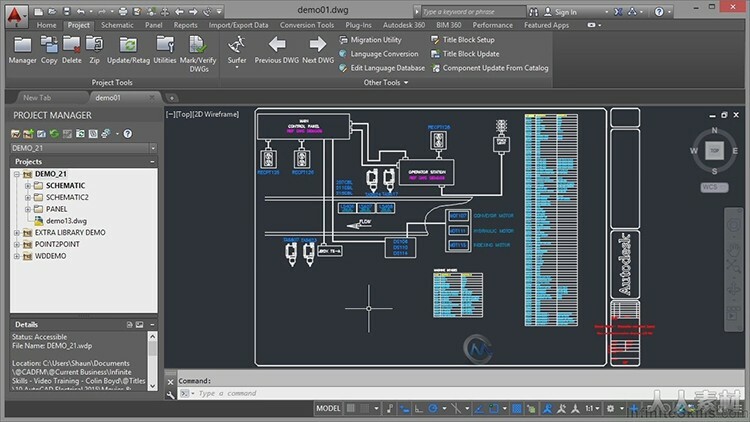 The more and more you use ACADE, you may require more components and circuits which is not there in the standard CAD library. By creating new standard user circuits and symbols you will become master of this art. These are the two major standards which normally use to design electrical circuits. In this session we will use both the standards to design the same circuit and will spot the difference. Finally we will do one sample project covering Single Line Diagram, Panel Layouts, Cable tray layouts, Room layouts, Schematic (Wiring) diagram and generating Bill of Materials.